Investors should keep an eye out for some extra tax forms each year. When you deal with interest income, form 1099-INT is the form you need to get your tax return done. This form isn’t limited to investors either. Anyone earning interest on savings accounts, money market accounts, CDs, or bonds is a potential candidate. However, it won’t report earnings from mutual funds invested in bonds. Mutual fund earnings are reported on 1099-DIV for dividends and distributions. This can be confusing without some good tax software or an accountant to help sort it out. It’s also why TurboTax comes in handy when I do my tax returns every year because it sorts out all the tax forms for me. Still, you should understand which tax forms to expect based on your investment earnings and what the 1099-INT reports to the IRS. This makes your yearly tax prep easier. When combined with some tax planning, can help lower your taxes over many years to come. Form 1099-INT is issued by banks, brokerages, and government agencies when you earn at least $10 in interest income. It includes tax-exempt interest income like you’d get from a municipal bond. Even though it’s exempt from federal income tax, the interest still needs to be reported to the IRS. Also, there might be state taxes to consider. 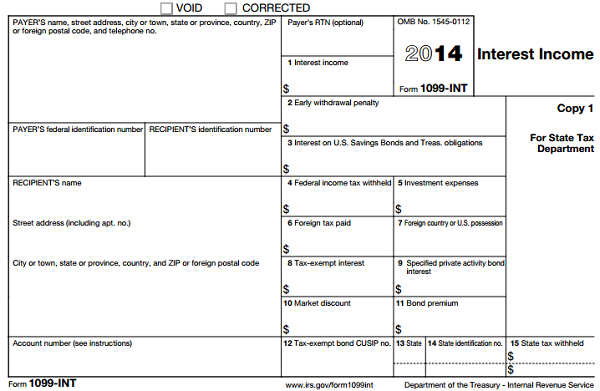 Form 1099-INT looks the same as other 1099 forms you get from investment income. For those with a brokerage account, it is included in a consolidated 1099. The type of investments you own determines which boxes are filled in. Don’t be surprised if several boxes are blank. It simply means there was nothing to report. On the left side is the payer’s and your personal information: name, address, and tax ID number. For example, the payer would be your bank for interest paid on a savings account or CD. On the right are 15 boxes that report interest income information. It includes both taxable and tax exempt interest paid, along with other important information used to find out what you owe the IRS. Box 1 reports the total taxable interest income paid to you for the year. Bank accounts, CDs, and interest bearing checking and brokerage accounts, all qualify. As long as you earned at least $10 in taxable interest you’re supposed to get a 1099-INT reporting it. Even if you didn’t, you still need to report it despite not getting a 1099 for it. Box 2 shows any early withdrawal penalty from an investment like a CD. For example, should you withdrawal money from a CD before it matures, the bank hits you with a penalty. That amount is deducted from your income. Box 3 covers interest earned from U.S. government bonds, specifically savings bonds and Treasury notes, bills, and bonds. This isn’t included with the taxable income in Box 1 even though it gets hit by federal income tax. Instead, it may be tax exempt at the state or local level depending on where you live. The next four boxes cover expenses and withheld taxes on any interest you earn. There are times when federal and foreign taxes are automatically taken out of earned interest. Federal tax withheld is reported in Box 4. This makes sure you don’t pay federal taxes again, since it was already taken out. It goes toward your taxes owed or adds to your refund. Box 5 covers investment expenses. But it’s not the typical investment expenses you’d think of. Instead, it refers to real estate mortgage investment conduits (REMIC) which is a pool of mortgages. Foreign taxes withheld are reported in Box 6 followed by the foreign country in Box 7. Many foreign taxes can be deducted from income or go towards a refund. Box 8 reports tax-exempt interest from investments like municipal bonds. This amount is exempt from federal income tax. This does not include tax exempt dividends from mutual funds which is now reported on 1099-DIV. Specified private activity bond interest is reported in Box 9. This is the amount in Box 8 which is subject to the Alternative Minimum Tax. The next three boxes deal with buying individual bonds. There are two ways to do this: directly from the issuer or on a secondary market. A secondary bond market is an exchange where investors can buy and sell bonds. This can create unique opportunities, but the accounting can get messy. Which is one reason bond funds are popular. As credit risk and interest rates change, bonds can be bought or sold at a discount or premium to par value. Box 10 reports market discount. A bond bought at a discount leads to a profit at maturity. That profit can be taxed at maturity (or when it’s sold) or it can spread out over the life of the bond or however long you own it. You need to tell your broker beforehand whether you elect to accrue the discount annually over the life of the bond. That annual accrual amount is reported here. Box 11 is the bond premium. A bond bought at a premium leads to a loss at maturity. That loss can be taken at maturity or it can be spread out over the life of the bond. When the loss is amortized in this way, that amount is reported here. Box 12 lists the tax exempt bonds that paid interest income by CUSIP number. The last three boxes report state income tax information. The state is reported in Box 13, followed by the payer’s state ID number in Box 14, and the amount of State tax withheld in Box 15. Like federal tax withheld, this amount goes toward any state taxes you owe or could result in a state tax refund.